Wolf Alice have gone through the newcomers stages, they have nailed all their live shows to date and are still getting better each time. Debut album ‘My Love Is Cool‘ was an amazing first record and they really showed Glastonbury what they are made of. All this and their feet are still firmly on the ground, not allowing themselves to be pressured into release another album and yet still not sitting back on what they have achieved so far. Wolf Alice have been teasing us with new songs for the difficult second album and with the opener ‘Yuk Foo’ it seems that we are in for a treat. 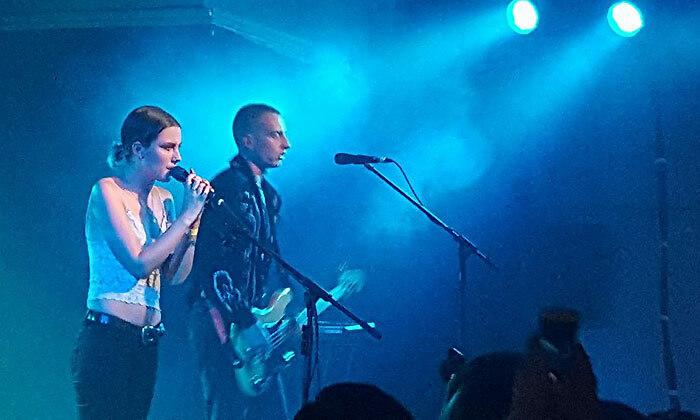 Rather than taking some time-out, Wolf Alice are out doing a mini tour before the release of the new record, to be followed by a full UK tour later in the year. Tonight is the turn of The Venue at Derby, and it’s a breath of fresh air to see that they are not hitting arenas; these are the places where music lives. Lights go down and the band enters the stage. No messing, they kick off with a new track called ‘Don’t Delete The Kisses’, a favourite with the fans already and low-key enough to boost the power and energy of the next three tracks. There’s ‘Bros’, followed by ‘You’re A Germ’, and, just as you are getting your breath back, ‘Yuk Foo’ is blasting out. Sweat is pouring everywhere and the whole place is just buzzing. During the course of the set we are treated to three more new tracks slotted between some highlights from the first album. New songs ‘VOAL’, ‘Beautiful Unconventional’ and ‘Formidable Cool’ all sound amazing and it becomes obvious that the new album is going to be as good, if not better, than their debut. ‘Fluffy’ gets the mosh pit going, and final song ‘Moaning Lisa Smile’ – from one of the early EPs – is very much a favourite among the Wolf Alice faithful. After their first exit, they return to rapturous applause for an encore, firing up the mosh put once again with the first chords of ‘Giant Peach’. This is clearly a band at the top of their game and if these snippets from the new album are anything to go by, they are only going to get better.